A Jewish Settlement In The West Bank Has Ties To Trump Administration : Parallels One of the fundraisers for a group that's raised millions for a seminary in the settlement is Trump's pick for ambassador to Israel. Trump and his son-in-law have made donations to the group. Israeli Prime Minister Benjamin Netanyahu has approved more than 3,000 new settler homes, including at least 20 in Beit El. Jabar Mousa was 15 when he first met the Jewish settlers who would move near Dura el-Qare, his Palestinian village in the central West Bank. It was 1977, and he and two friends were walking on a nearby hill. That's where they saw a group of young men in yarmulkes. "We stop and asked these young men, who are you?" says Mousa, now 56. "And they said, 'We are students of the yeshiva. We study in a school in Beit El.'" Beit El is Hebrew for "House of God." The yeshiva students were camping out at an old Jordanian army base after Israel captured the West Bank in 1967. But they believed they were near the site where the biblical Jacob dreamed of angels going up and down a ladder to heaven. "So this is considered a holy area, a holy site," says Chaim Silberstein, a Beit El councilman. "Therefore, the return to Beit El is considered a return to 4,000 years of Jewish history." A settler walks past a new building in Beit El's yeshiva complex. Trump's pick for ambassador, David Friedman, has raised money for the yeshivas in Beit El. Silberstein, who was born in South Africa, moved to the settlement — near the West Bank city of Ramallah in the hills north of Jerusalem — in 1985. "I was 24 and wanted to study Judaism," he says, "and the yeshiva gave me dormitory, a mobile homes to live in." Back then, 150 families lived here. Now there are about 1,200 — about 7,000 people total. Beit El is a slice of Jewish Orthodox suburbia. It has clinics, a steakhouse, a horse-riding school, 20 kindergartens and a roundabout with sculptures of pomegranates, figs and grapes. 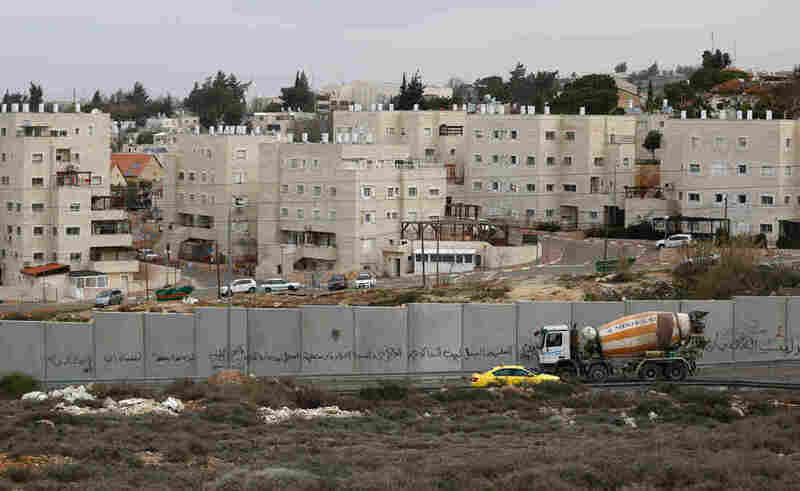 The U.N. considers settlements illegal. Breaking with Obama administration policy, President Trump's administration has said it doesn't see them as a barrier to peace — though Trump was quoted Friday in an Israeli paper saying, "I'm not someone who believes that advancing settlements is good for peace." Since Trump was inaugurated, Israeli Prime Minister Benjamin Netanyahu has approved more than 3,000 new settler homes, including at least 20 in Beit El. Chaim Silberstein says he hopes for hundreds more. 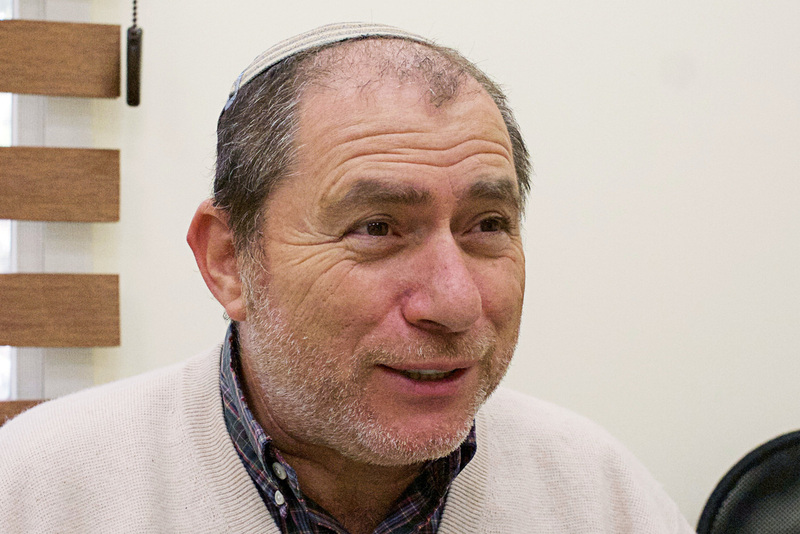 Chaim Silberstein, a Beit El councilman, moved to the settlement in 1985. He hopes that more settler homes will be approved for the area. "The greatest smell for people that want to build is the smell of mud and dust and earth," he says. "I believe within the next few months, possibly, we could begin to see some bulldozers working in Beit El." 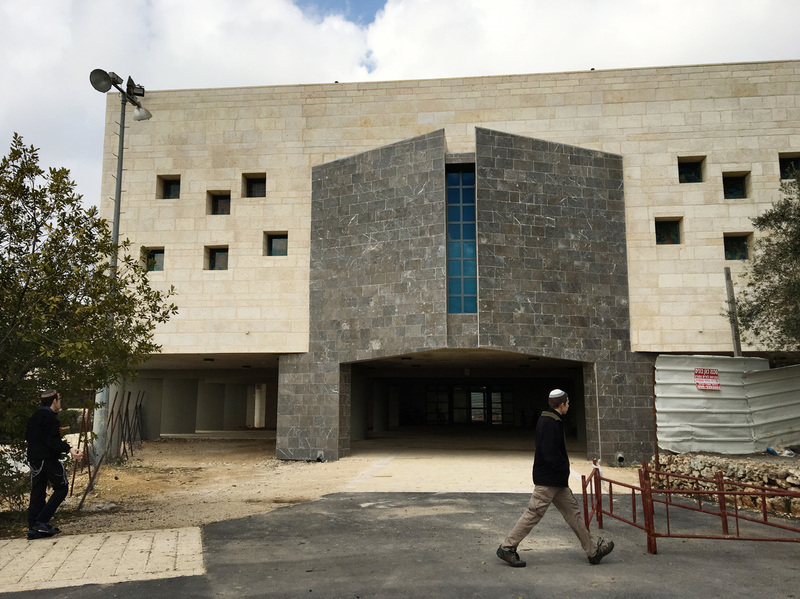 The American Friends of Beit El Yeshiva has raised millions of dollars for the seminary here; one of the group's fundraisers is David Friedman, Trump's pick for ambassador to Israel. Trump's son-in-law and Trump himself have made donations. Those in Beit El who've met Friedman, including Hillel and Nina Manne, like him, but don't expect the bankruptcy lawyer and son of an Orthodox rabbi to drastically change the life of Jewish settlers like them in the West Bank. "The U.S. State Department isn't going to change that quickly," Hillel Manne says. The Mannes own a winery that produces about 20,000 bottles a year and exports to the U.S., Europe and South Africa. There's also a factory that makes tefillin, or phylacteries, containing parchment scrolls that Jewish men wear on their heads during morning prayers. The verses inside are handwritten by Yoni Framowitz, the resident Torah scribe. "I've never met David Friedman," he says. 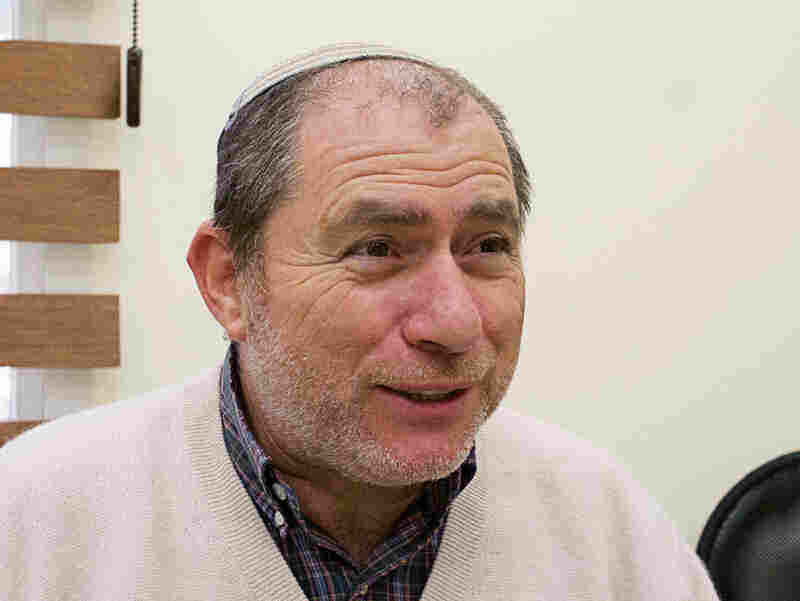 "I know nothing about him other than the tefillin he wears he purchased here." "Whoever can help us live what's in the Scriptures and fulfill the promise of this land, that's very good," says Avraham Babad, whose family runs the factory. But what's been good for Beit El has not been good for everyone. The settlement sits right in the middle of the West Bank, partly on land that used to be farmed by Palestinians, and is one reason why Palestinians see settlements as a threat to their independent state. Jabar Mousa was 15 when he first met Jewish settlers that would move to Beit El. Mousa is now a member of the council of Dura el-Qare, a nearby Palestinian village. 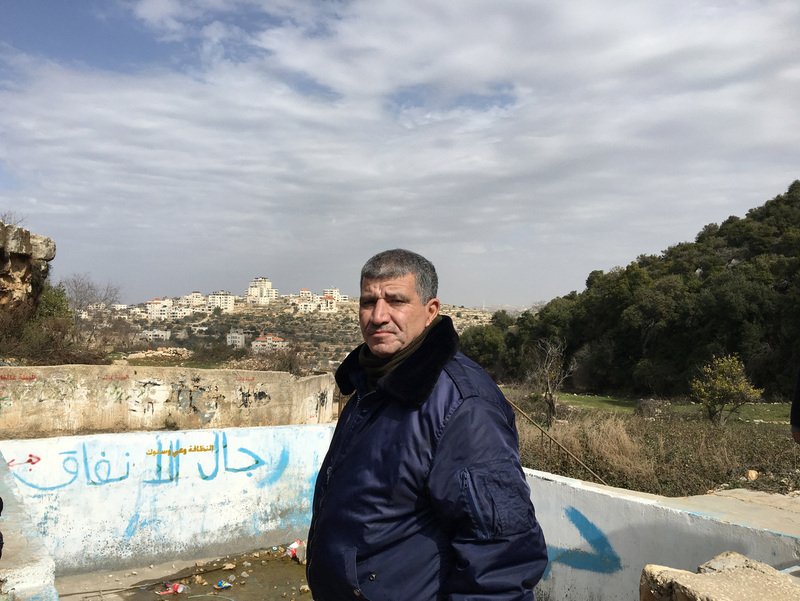 Jabar Mousa, who saw the young yeshiva students walking on a hill 40 years ago, is now on the council of Dura el-Qare, the nearby Palestinian village. At the village well, where women fill up plastic bottles with water, Mousa's friend, a 66-year-old olive farmer named Abdul Jabbar Abdel Azzis, points to the roofs of Beit El homes and a fence cutting off land Israelis label a closed military zone. "See that land, that part under the rocks there, on top of the hill?" he says. "That's my land, which I cannot access." He climbed the hill 17 years ago, just to see what it felt like to stand there, even though he was afraid he'd get shot. "I only stayed for a few minutes," he says. "And then I ran down the hill like a thief. On my own land, I felt like a thief."